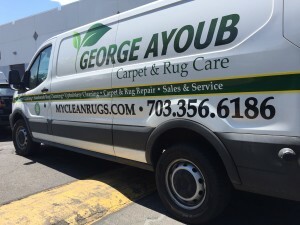 George Ayoub Carpet, one of the greenest carpet cleaning service in Virginia has recently extended its service area to serve customers in Arlington, VA with the highest quality carpet cleaning and rug cleaning, the company which started in 1987 has plans to cover more areas in Northern Virginia, Maryland and Washington DC. The Sterling carpet cleaning company was founded by George Ayoub, with the addition of his son Jimmy in 2001, their success has made it possible for them to build a state of the art rug cleaning facility with multiple trucks for In-home wall to wall carpet cleaning, rug cleaning and repairs. This father and son team is proud to offer the company’s green carpet cleaning service to their friends and neighbors in Arlington, VA.
“My father and I are excited to bring our services to homeowners, residents and businesses in Arlington, VA” said Jimmy Ayoub, the president of GAC. “Not only do our carpet cleaning and rug cleaning services offer an eco-friendly solution, but also we pride ourselves on our solid keenness to provide our customers with the highest quality customer service” he added. George Ayoub Carpet is known for hiring the best staff based on the philosophy that talented, hard-working staff is the company’s greatest asset. George Ayoub Carpet management strives to make the company an employer of choice by providing fair compensation, the tools and training to excel, and personal growth opportunities. Founded in 1987, George Ayoub Carpet has positioned itself as the premier, eco-friendly option within the carpet cleaning industry. Relying on high powered and efficient truck mounted hot water extraction system also known as steam cleaning, the company’s carpet cleaning solutions provide excellent results while still being safe for children, animals, and the planet. Next Post Why you should hire professional carpet cleaning company in Sterling, VA?